I have several fond memories from my childhood associated to citrus -- elementary school citrus drives leading to boxes upon boxes of oranges and grapefruits in the house; my grandmother's citrus compote, as she was the only one patient enough to remove all the pith; and ski hill lunches, always ending with two (or more) clementines. With winter upon us, we've been trying to have a steady flow of clementines in the house, and the occasional orange or grapefruit, but nothing like it was when I was a kid. The abundance of citrus had left me wanting to bake something citrus-y. I quickly realized that I don't actually like the flavour of oranges in baked goods, and the grapefruit was being saved for this. 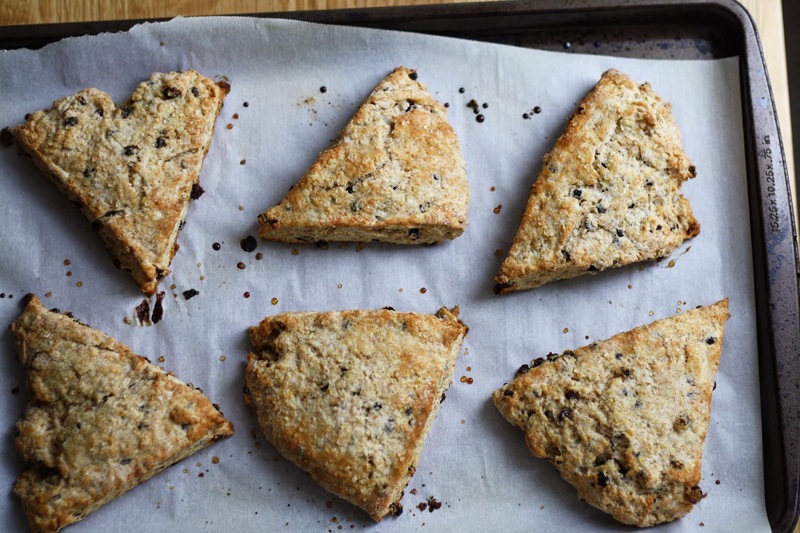 So I turned to the trusty lemon, and though not super wintery, these scones were the perfect compliment to my mid-afternoon cup of tea. 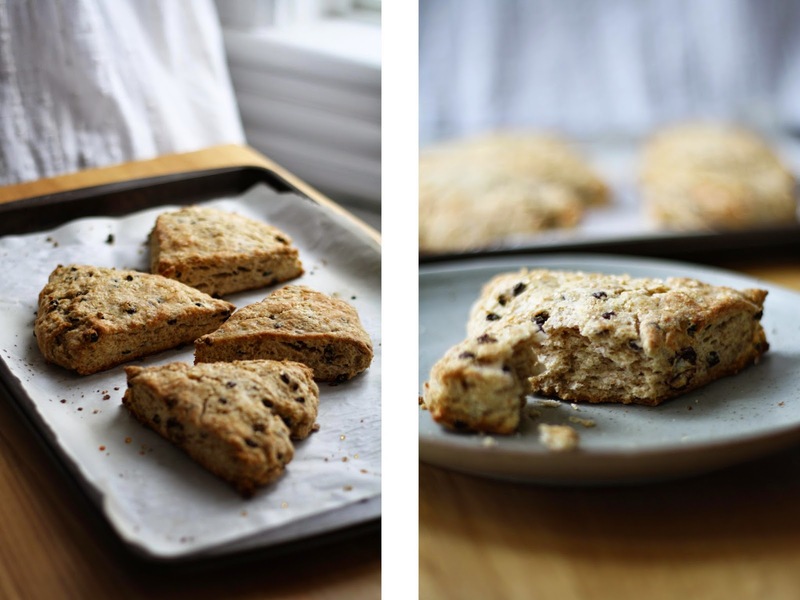 This was my first attempt at 'american scones,' and I was quite pleased with how they turned out. 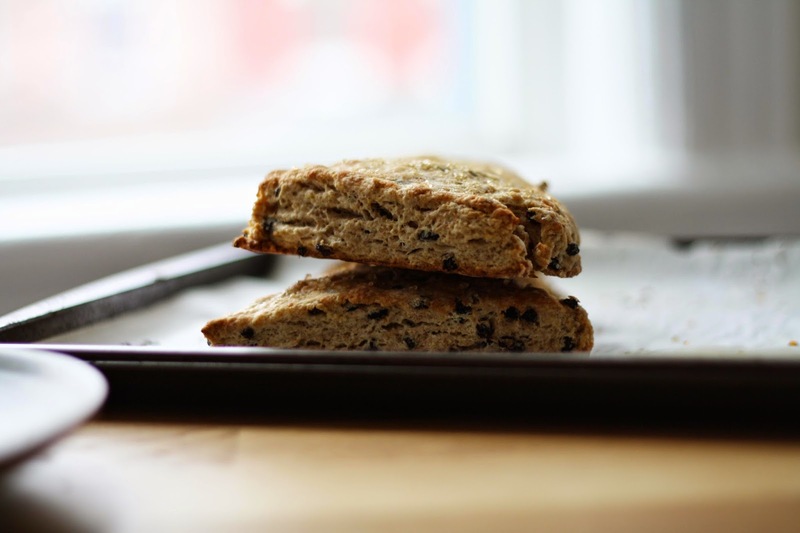 Light enough to resemble a british scone, but with a fine crumb that almost resembles a muffin. 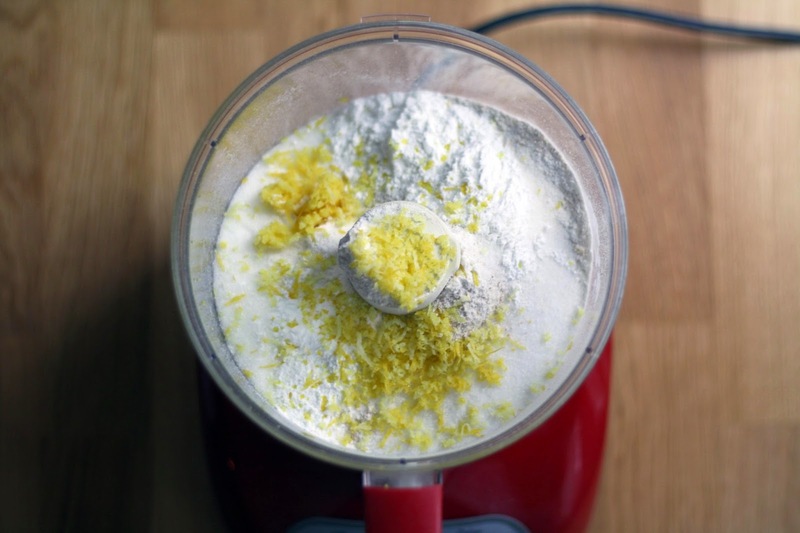 In a food processor fitted with the s-blade, combine the flours, sugar, baking powder and lemon zest. Pulse 2-3 times. Continue to add the butter cubes, and pulse 7-8 times, until the mixture reaches a coarse, pea size crumb, texture. Transfer to a bowl and stir in the currants. Add the yogurt to the faux-buttermilk, and pour gently over the dry ingredients. Stir until just combined, being sure not to over mix. Transfer the dough onto a lightly floured surface and work the dough into a ball. If the dough isn't holding together, add a splash of water. Once in a ball, press the dough down with your palms, forming a 1/2" thick disk. Using a knife or pizza slicer, cut into 6-8 triangular pieces. 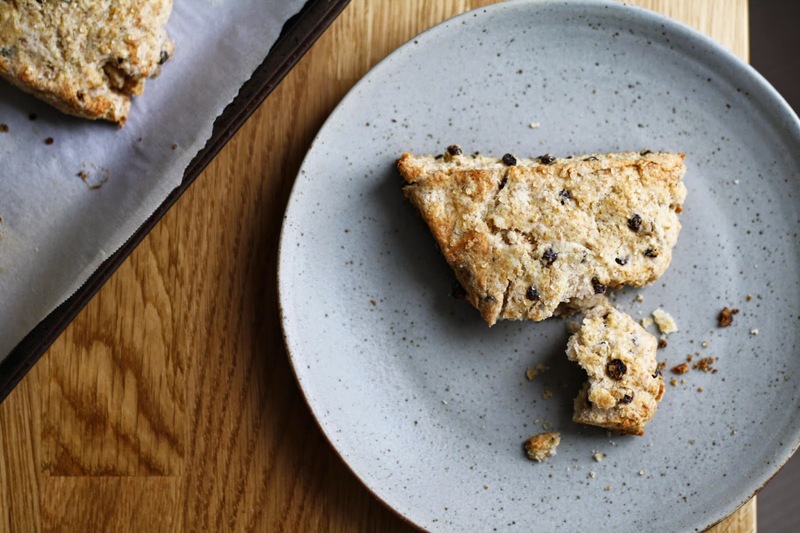 Transfer the scones to a parchment lined baking sheet. Brush with a small amount of milk, and sprinkle with coarse sugar. Bake for 13-17 minutes, until golden brown. Transfer to a wire rack and let cool slightly. Best served warm, or at room temperature.